Ticking Away - Page 5 - Welcome to TVPaint Community forums ! The Holland Animation Film Festival 2016 will be held from the 16th to (and including) the 20th of March in Utrecht. Ticking Away will be having it's world premiere at this festival. Here are the screening dates and veneus for our film. We have been selected for the National as well as the International Competition programs AND our film will be among the selection in the opening night program, screening what the HAFF considers to be the highlights of the festival. I had a great time at the Holland Animation Film Festival the last few days! Received a lot of comments, critique and feedback and met many established, as well as new, filmmakers and had many interesting conversations with the audience. We even managed to secure a nomination for a MovieZone HAFF award! The contrast in colours accompanied by a mesmerizing soundtrack, gives this film a weight of emotion; told as loudly as a silent film possibly could. A story so captivating, it doesn’t leave your mind the moment it fades from the screen. 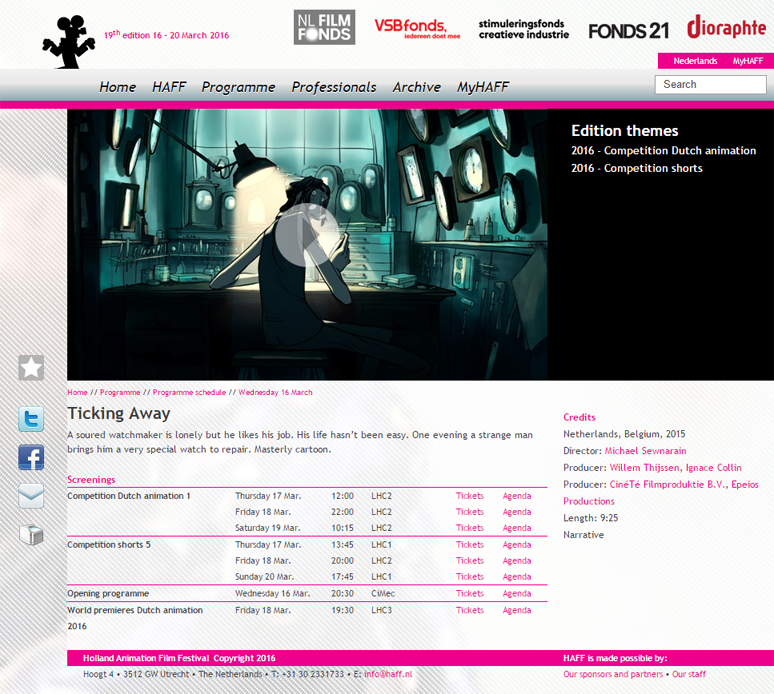 Truly a masterpiece with an animation style that matches its excellence." But we didn't win, though... Better luck next time. Here's the juryrapport with the winner. And the Palmares make it official! Thanks. And good luck on your adventure in Annecy! Thx! I tell you, it was quite the experience to see my poster show up in this month's TVP newsletter! "They're advertising with me??" Anyway, first I go to Stuttgart for the whole next week, I'll keep you updated. Yes, please do keep us posted if you can! Annnnd... it's online. After it's year and a half in the sun in and around the festival circuit it's finally time to put my short film online. So here it is: 9.5 minutes in full. That's a really nice short film. That was gorgeous ! Bravo Sewie ! Thank you, guys. Very nice to hear. Now featured as https://www.cartoonbrew.com/cartoon-bre ... 56861.html! Wow! Everything about this is amazing.